Adoption of software as a service (SaaS) has been growing at a much faster clip globally than traditional software thanks to the former's ability to cut the costs of one time licensing fees and also the need for investing in additional IT infrastructure to support new applications. SaaS is the new way of consuming software. So there are SaaS based business models in areas like customer relationship management, supply chain management, web conferencing, human resource management, financial management, and E-commerce, to name a few. India also happens to be bang in the middle of this evolving SaaS ecosystem. 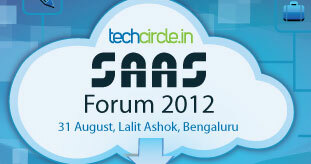 The SaaS activity has been gaining momentum in India in the last couple of years, and to draw experiences from entrepreneurs who have struck early successes, Techcircle.in is organising its inaugural SAAS Forum 2012 on August 31 in Bangalore. The forum would bring together entrepreneurs, investors and other players in the SaaS ecosystem on a single platform to discuss the opportunities and challenges in building large scalable SaaS businesses out of India. The event kick-starts with a look at innovation and entrepreneurship in SaaS and how it overcomes barriers related to deployment, costs and utilisation of software. Companies across sectors have begun seeing the merits of focusing on core competencies, while relying on service providers to support non core operating processes through a SaaS platform. The panelists will share their perspective on attractive SaaS business models that can be scaled rapidly and how firms are overcoming the challenges to marketing and reaching out to a larger audience. They would also look at target market, dwell on whether it is better to begin with international market or the Indian market, besides zooming in on the prospective defining points for successful businesses in this segment. In a special session bringing together leading entrepreneurs in the SaaS space, the event will also look at insights on key aspects of building a large SaaS enterprise from India. It would seek to figure out what the entrepreneurs of SaaS businesses should focus on while building their enterprise and how to sync various strategies on product, pricing, marketing and distribution. The forum would also touch upon the sectors that can be driven by SaaS, including healthcare, hospitality, education, ERP, CRM and HRM. The meet would also aim to capture the key element of pricing SaaS products: whether to make it free or go with a 'freemium' or a blanket-premium pricing model. The forum would also feature Techcircle Runway, a take-off platform for five promising startups to bring them a few steps closer to the next level of growth — be it funding, setting up new teams, client acquisition or getting insightful advice and business tips from experts. Each startup will present on their inception, business model, significant milestones, growth path and projections. This will be followed up with Techcircle Lounge, providing an opportunity for one-to-one interaction with India's topmost venture capital investors in a special structured session limited to select ten SaaS companies and ten investors looking to bet on SaaS as a business space. For more information and registration click.